LA MULTI ANI tuturor celor ce poarta numele Florica, Florin, Florea, Florentina, si orice nume de floare! 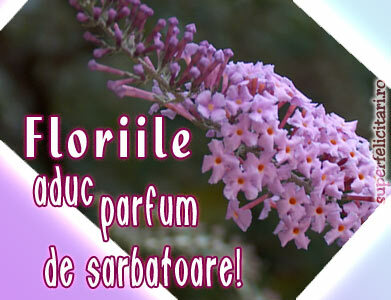 Duminica Floriilor sau Floriile se sarbatoreste in ultima duminica dinaintea Pastelui. Ea serbeaza sfarsitul postului dar si reinvierea naturii. De Florii, oamenii merg la biserica pentru a sfinti crengute de salcie pe care le pun la geamuri, la usi sau la porti. In unele parti ale tarii, locuitorii de la sate se incing cu ramurile de salcie peste mijloc. Credinta spune ca acest ritual ii apara de boli si ii face mai robusti. De asemenea, apara casa de rele si o protejeaza de evenimente neplacute. In Duminica Floriilor, gospodinele merg la biserica si curata mormintele stramosilor, agatand de cruci ramurele de salcie. Tot de Florii, se agata intr-un pom inflorit jnurul de martisor, si alatuturi de jnurul de martisor se agata haine si zestrea fetelor de maritat. Fiind o sarbatoare care marcheaza reinvierea naturii, sensul ei este atribuit si elementelor din viata cotidiana. In unele zone, fetele pun in noaptea de Florii busuioc sub perna, spre a deveni mai frumoase si mai sanatoase, mai dorite de carte flacai, pentru a se putea marita in acel an. In Muntenia, oamenii nu se spala pe cap deoarece exista crezul ca daca faci asta in Duminica Floriilor, in care toti pomii infloresc, vei albi precum coroanele albe ale copacilor. Din punct de vedere religios, Floriile marcheaza Intrarea in Ierusalin a Mantuitorului. In aceasta zi este dezlegarea la peste. Eurovision Hai sa o luam de la inceput 1956! Incep astazi o antologie EUROVISION. Sper sa aveti rabdare si sa revedeti/vedeti. Saptamina trecuta Romania a decis melodia care ne va representa la Eurovision. Buna sau rea va trebui sa o sustinem! Si acum sa dam Cezarului ce este al Cezarului! Ne revedem miine cu urmatoarea decada…Nopate buna. Pentru Noi Asa Zisul Sexul Slab…. International Women’s Day (8 March) is an occasion marked by women’s groups around the world. This date is also commemorated at the United Nations and is designated in many countries as a national holiday. When women on all continents, often divided by national boundaries and by ethnic, linguistic, cultural, economic and political differences, come together to celebrate their Day, they can look back to a tradition that represents at least nine decades of struggle for equality, justice, peace and development. International Women’s Day is the story of ordinary women as makers of history; it is rooted in the centuries-old struggle of women to participate in society on an equal footing with men. In ancient Greece, Lysistrata initiated a sexual strike against men in order to end war; during the French Revolution, Parisian women calling for “liberty, equality, fraternity” marched on Versailles to demand women’s suffrage.The idea of an International Women’s Day first arose at the turn of the century, which in the industrialized world was a period of expansion and turbulence, booming population growth and radical ideologies. Following is a brief chronology of the most important events:1909In accordance with a declaration by the Socialist Party of America, the first National Woman’s Day was observed across the United States on 28 February. Women continued to celebrate it on the last Sunday of that month through 1913.1910The Socialist International, meeting in Copenhagen, established a Women’s Day, international in character, to honour the movement for women’s rights and to assist in achieving universal suffrage for women. The proposal was greeted with unanimous approval by the conference of over 100 women from 17 countries, which included the first three women elected to the Finnish parliament. No fixed date was selected for the observance.1911As a result of the decision taken at Copenhagen the previous year, International Women’s Day was marked for the first time (19 March) in Austria, Denmark, Germany and Switzerland, where more than one million women and men attended rallies. In addition to the right to vote and to hold public office, they demanded the right to work, to vocational training and to an end to discrimination on the job.Less than a week later, on 25 March, the tragic Triangle Fire in New York City took the lives of more than 140 working girls, most of them Italian and Jewish immigrants. This event had a significant impact on labour legislation in the United States, and the working conditions leading up to the disaster were invoked during subsequent observances of International Women’s Day.1913-1914As part of the peace movement brewing on the eve of World War I, Russian women observed their first International Women’s Day on the last Sunday in February 1913. Elsewhere in Europe, on or around 8 March of the following year, women held rallies either to protest the war or to express solidarity with their sisters.1917With 2 million Russian soldiers dead in the war, Russian women again chose the last Sunday in February to strike for “bread and peace”. Political leaders opposed the timing of the strike, but the women went on anyway. The rest is history: Four days later the Czar was forced to abdicate and the provisional Government granted women the right to vote. That historic Sunday fell on 23 February on the Julian calendar then in use in Russia, but on 8 March on the Gregorian calendar in use elsewhere.Since those early years, International Women’s Day has assumed a new global dimension for women in developed and developing countries alike. The growing international women’s movement, which has been strengthened by four global United Nations women’s conferences, has helped make the commemoration a rallying point for coordinated efforts to demand women’s rights and participation in the political and economic process. Increasingly, International Women’s Day is a time to reflect on progress made, to call for change and to celebrate acts of courage and determination by ordinary women who have played an extraordinary role in the history of women’s rights. Few causes promoted by the United Nations have generated more intense and widespread support than the campaign to promote and protect the equal rights of women. The Charter of the United Nations, signed in San Francisco in 1945, was the first international agreement to proclaim gender equality as a fundamental human right. Since then, the Organization has helped create a historic legacy of internationally agreed strategies, standards, programmes and goals to advance the status of women worldwide.Over the years, United Nations action for the advancement of women has taken four clear directions: promotion of legal measures; mobilization of public opinion and international action; training and research, including the compilation of gender desegregated statistics; and direct assistance to disadvantaged groups. Today a central organizing principle of the work of the United Nations is that no enduring solution to society’s most threatening social, economic and political problems can be found without the full participation, and the full empowerment, of the world’s women. You are currently browsing the Gabi & Daniel's Blog blog archives for March, 2010.